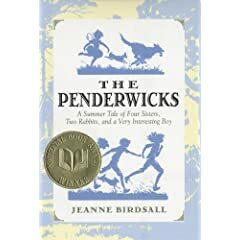 Officially titled The Penderwicks: A Summer Tale of Four Sisters, Two Rabbits, and a Very Interesting Boy, this book is worthy of its National Book Award and written by first time author Jeanne Birdsall. I know this is no new book, and many people have reviewed it with good and bad results. Personally, I loved it. I thought it was a great "old-timey" type story. There weren't many frills and extra crazy events to distract from the original point of the author. (Which by the way was to write a book that reminded her of her own childhood favorites.) The characters were sweet, but yet each had their own voice as a strong young woman. There were lessons to be learned, characters to cheer for, characters to despise, and a setting to wish you could see in person. I felt better about myself for reading it. As if I had just read a book that I could share with my children and grandchildren. (Should there ever actually be children and grandchildren.) I actually love the fact that you are never really sure the time period in which this story takes place. I was so reminded of Little Women the whole time I read this book. The book is just right for most ages, but not all readers. This book would take a strong fourth or fifth grade reader to read alone. It would appeal to many young girls and select few young boys. It would work best as a read aloud I feel. One and only one complaint I had is a complaint I have had for other recently read books... THE NAMES, THE NAMES, THE NAMES! Is is necessary to name characters obscure names like Rosalind???? Skye (not bad, but not great either) Batty? Cagney?? Arundel Hall???? It is so distracting for kids trying to read a book on their own. That is one thing I would rather my students not have to deal with. Get with it. Kids don't care what the characters are named. Next up, some great new stuff! I am so excited for my pile of books from the library! Thanks for linking to my review out of the 9000 choices! I love this book, too. It reminds me of authors like Elizabeth Enright, who have a keen sense of what ordinary things are fun and/or interesting. I recently bought this book after reading a blog review. Thanks for making me feel good about my purchase.